A new year brings along new opportunities and new challenges. The SEO world, too, is preparing to combat unexpected threats, especially from various Google penalties. What are those possible threats? Imagine, you wake up one fine morning and get a call from the office reporting, “We have lost all traffic,” and your heart stops. It’d be no less than a nightmare… your worst nightmare, in fact. But did you know this could really happen, at any time? Whether you like it or not, websites in variety of niches depend on Google for a high percentage of their traffic. 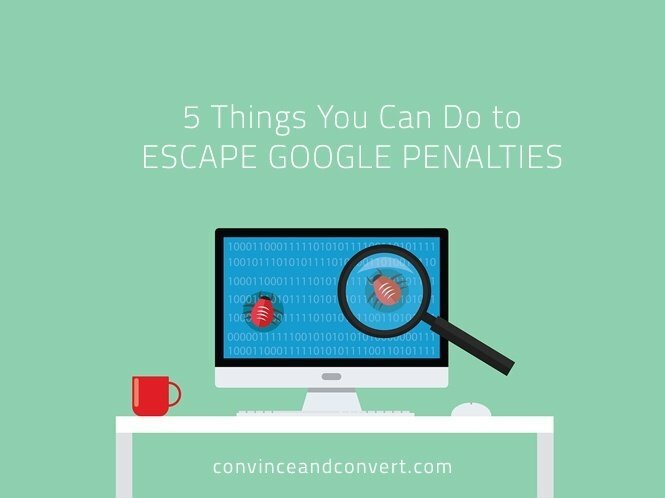 If you get hit by a penalty, anywhere from 10% to 50% of your traffic can be wiped out in an instant. According to Matt Cutts, around 400,000 of these kinds of actions are being initiated manually every month by Google. Many other sites are being penalized by Google algorithmic updates—especially the big boys, Penguin and Panda. Yes, quite a scary thought! But to every problem, there’s a solution. Regardless of the type of penalty that triggers you, you need to be able to diagnose what caused it and resolve it. These effective tips can teach you how to get rid of any penalties that can hold back your organic traffic. Schema markup, or structured data markup, can be an effective way to improve search engine content discovery, organic search visibility, and indexation. Some Schema markups get recorded by Google’s Knowledge Graph, which produce Rich Snippets and are visible in local results. These help improve organic search visibility and click-through rate. However, due to the latest spammy structure markup penalties from Google, structure data can harm your site if not used correctly. According to the new Rich Snippet policies released in March 2015, Google specified that these types of snippets can be applied only on definite items and not on “category” or “list of items” landing pages. Include test markup in the Structured Data Testing Tool. Before appearing online with schema markup, make sure to validate it using Google’s Structured Data Testing Tool. Check for errors, and implement them accordingly. Keep track of the Structured Data details in your Google Search Console (Webmaster) account. This report can help you get an idea of your website’s Structured Data faults and indexation. Confirm if Structured Data implementation matches with Google’s latest guidelines. Review the latest guidelines and policies released by Google for structured data, and strategize your work accordingly. You can also checkout Google Structured Data Policies here for creating high-quality structured data. In early December of 2015, Google announced, “With the holidays upon us, we will not release the next Penguin update in the end of this year.” But we can expect the next Penguin update some time in early 2016, and it will be a clear warning for websites with spammy links. Though external links get the most attention, ignoring the signals you’re giving Google with your internal links isn’t smart. While these might not have a great impact on your rankings, they do heavily influence how Google crawls your site. Internal links are the ones you have control over. With these links, you can help direct the search engines to pages with higher importance and those thematically related to one another. Your internal links can also be over-optimized, just like your external links. To gain maximum benefit, link webpages that are relevant with each other. It is possible that someone looking for Page 1 could be interested in knowing the content on Page 2 as well. Maintain as much hierarchy as possible in your webpages. Create your anchor-text with generic words (non-descriptive), and avoid using the exact keywords. Earlier this year, Google released yet another important algorithm in April 2015: Mobilegeddon, a mobile-friendly update. According to the update, all websites must be mobile-responsive, or else their traffic and ranking will plummet greatly. Pass the mobile-friendly test. Google offers a mobile-friendly test to help webmasters determine whether or not their site is mobile-responsive. It also has an official Mobile SEO Guide that can tell you what Google is looking for in your site. Your website should be optimized for mobile experience by adopting practices like increasing button and text size, adding additional space between links, changing the layout of elements, matching the page width with the screen width, and increasing the speed of the page. Mobile-friendly images and fonts. Images rule the web. Make sure you use smaller images that can be loaded easily and fully on mobile devices. Use legible font sizes for mobile sites so that reading the website content becomes easy for smartphone users. Negative SEO has become a major concern for webmasters today. I, too, was affected by this unethical practice when one of my competitors tried to create spam links and distribute my content all over the internet for one of my clients’ websites. Unfortunately, it successfully affected the ranking of my client’s website. The competitor then reached out to my client, showed the bad backlinks, and tried to get some work out of it. Since we were already monitoring the backlinks, we had already informed the client that someone was creating bad links. Monitor your backlinks profile. The best way is vigilance! Keep your eyes wide open, and check if someone is creating links or visiting your site frequently. Various tools, such as Ahrefs and Open Site Explorer, can be used for manual detection of such activities. Protect your best backlinks. Often, attackers try to remove your top backlinks, usually by contacting the website owners using your name. Keep track of your best backlinks. Report alleged negative SEO tactics. Google’s Disavow tool is a great tool for reporting negative SEO attacks. This allows webmasters to quickly report any suspicious activity on their website. This informs Google about the suspect and helps Google eliminate them after assessing the site. Google pays major attention to user signals—how good a website is in terms of offering user experience. To avoid getting trapped with Google penalties for good rankings, it is crucial that your website offers well-optimized technical performance. The factors that can really affect your website are low CTR, high bounce rate, low time on website, low amount of returning visitors, etc. Design and layout: Redeveloping your site and doing a refresh constantly will give your user an optimized experience preventing them from bouncing. Easy navigation: Optimization of internal links and proper flow of pages point to good, structured navigation. Site speed: This is an official ranking factor. Offer your users webpages that load quickly, so that they don’t jump to other sites for what they’re looking for. Other factors that can enhance user experience include mobile versions of your site, fewer ads, avoiding Flash and similar formats, links to social media profiles, and proper calls to action. Google is constantly updating its algorithms and features to offer the best user experience possible. Working in accordance with the guidelines Google provides, prior to the release of any new updates, can prove significant for webmasters and publishers to avoid penalties. Varun Sharma is a digital marketing expert and a director of the fastest-growing digital agency in India, KVR WebTech. You can also subscribe to Varun's personal blog at varun-sharma.info.